By the time the final vote was taken on the City of Falls Church Fiscal Year 2010 budget Monday night, the Falls Church City Council was in full agreement, and voted unanimously to adopt the $66.6 million package that includes the full request for funds from the Falls Church School Board. The budget total is 5.7 percent less than the current fiscal year, reflecting the economic hard times. It involves a scaling back of the local GEORGE bus system, no new capital improvement spending, a wage freeze, seven City staff layoffs and an increase in the real estate tax rate from $1.03 to $1.07 per $100 of assessed valuation. With declined real estate assessments in the City, the tax rate hike adds up to a modest $70 net tax bill increase for the average homeowner. 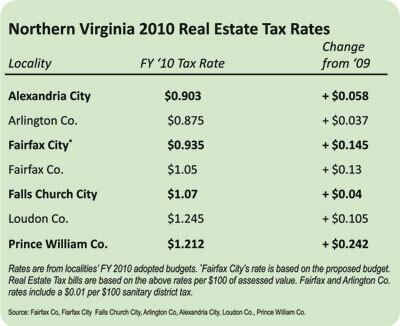 The impact of the Falls Church budget was far less severe than in other regional jurisdictions, where the decline in housing values has caused far more grief. In Fairfax County, the budget adopted there includes over 300 layoffs. Despite deep concerns for the loss of three full-time and three part-time positions at City Hall, the first time jobs have actually been lost in the City government in memory, all on the F.C. Council exhibited a mood of cooperation and camaraderie sailing through to the budget finish line at about 10 p.m. on Monday. What had been building as a contentious meeting, including wrangle over the choice of funding for schools or avoiding layoffs, failed to materialize. There was almost no participation in the public hearing segment of the meeting, and no discord on the Council. It was a far cry from moods on the Council when the members first received the recommendations of City Manager Wyatt Shields six weeks earlier. Shots flew back and forth across the bow, both verbally and in letters to the editor, as the Council first confronted the challenge of a significant reduction in spending. “It took a lot of individual conversations to find a common ground,” Falls Church Mayor Robin Gardner told the News-Press in an interview Tuesday. She was asked how the mood of contention at the outset wound up with so much sweetness and light. “Each Council member had their important issues that needed to be addressed,” she said, running from saving the bus system in some scaled back form (Shields recommended de-funding it, altogether), to dealing with parks and storm water issues and keeping mulch deliveries free for City residents. Gardner said a series of one-on-one meetings and communications between the Council members proved key. The News-Press witnessed two such one-on-ones, the first in the early morning between Gardner and Councilman David Snyder at the Original Pancake House on April 14, and the second late at night in the parking lot outside a just-concluded School Board meeting between Vice Mayor Hal Lippman and School Board Chair Ron Peppe on April 21. This Monday, Snyder said he believed the budget “reflects the core values of the City,” something he heatedly charged it did not last month with the original proposal to de-fund GEORGE entirely. In the meantime, the City found a way to fund a scaled-back operation of GEORGE, eliminating midday and other routes, with state funds and a draw from the Northern Virginia Transportation Fund with no dollars out of the City operating budget. Snyder said that GEORGE’s “effectiveness is essential” to its continued operations, adding that “a major reduction in the public subsidy” of the system was appropriate. Councilman Dan Sze quipped that “I drew my line in the mulch,” pleased that mulch deliveries will remain free for City residents, while non-City residents will be charged nominally. Councilman Nader Baroukh said that “the community’s values are maintained in this budget,” citing “keeping the schools strong,” a low tax rate, and keeping key services, such as library hours, road maintenance and attention to storm water management. Councilman Lawrence Webb cautioned that the next fiscal year budget will be even more difficult. “I support this budget with reservations,” he said. Shields noted the budget marked the fourth straight year of net spending cuts in the City budget, down in absolute dollar terms by $2.7 million in FY 2010 compared to FY 2006.